Excerpt showing three channels inserted into one HD panel for preview purposes only. 3 Royal New Zealand Air Force Bell UH-1 Iroquois perform a choreographed 3-ship flight during their alpine training Exercise Blackbird in July 2010. The formation of helicopters takes off at Dip Flat RNZAF base and reaches the Leese valley. Large scale video-performance collaboration b etween Alex Monteith, Royal New Zealand Air Force 3 Squadron & SQDNLDR Oliver Bint at Dip Flat during Ex Blackbird, Aotearoa, NZ, July 2010. .Three simultaneously flying RNZAF Iroquois helicopters perform a collaboratively generated flight routine in the Ex Blackbird locations with onboard recordings for three-channel video installation. Area; Dip Flat, Leese Valley. Three helicopters take off and fly the valleys in the line-astern formation with Frame no 14 front, Frame 05 middle and Frame 01 Rear. The formation flys line astern up the Clarence River Valley and doglegs into the Leese valley and flies into deep into the catchment and performs a sweeping turn. 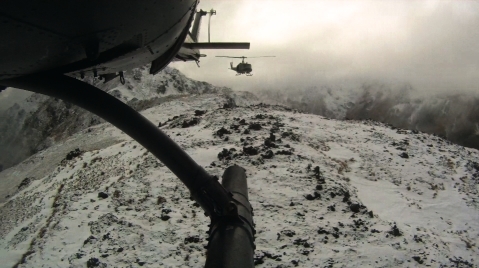 The formation returns to the entrance of the valley and makes a slow approach to a ridge top where each helicopter performs a 360-degree pedal turn simultaneously. This is the key maneouvre of the artwork and was developed specifically to test the scope of both the formation of the flights against the reinstallation method as a video-artwork. The formation hovers stationary briefly, before the order of helicopters is reversed an Frame 01 leads off, Frame 05 remains in the centre and Frame 14 flays at the rear of the new line astern formation. 3min excerpt of the LHS channel of the three channel install. Onboard footage from the front helicopter in the formation, RNZAF 14 (FLTLT Wilson & FLTLT Netzler, crewmen; Tahi-Martin & Woodley).